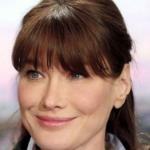 Around 7:30 pm on 19th October, Carla Bruni-Sarkozy, France’s First Lady, gave birth to a baby girl. She had been hospitalized earlier that day in one of the most exclusive Parisian private hospitals. At a crucial time for Europe, Nicolas Sarkozy had a meeting with Angela Merkel and was therefore not present at the birth. He saw his new baby later in the evening. Carla Bruni, already mother of a ten-year-old called Aurelien from a previous relationship, declared a few weeks before giving birth that she will protect the baby from the Medias. Will this new baby be a political opportunity for the French President as it was for the Blair or Cameron couples? Will Nicolas Sarkozy’s current low popularity rate improve in the months to come? This is all to be seen. comme on dit souvent:..... c'est surement ce qu'il a fait de mieux!!!!! The President who wants a France more Bleu Blanc Rouge than ever and he is not giving a French name to is daughter... Irony!